“’tis the season to exhibit” bah humbug! Yesterday I found myself putting up the Space2Create Christmas log tree! If you look at the high street this is not unusual. With exactly one week to go before an open weekend at The Factory we are in a bit of a panic as we swap the bare walls of the Transformations Project for a new mixed open exhibition. I haven’t even thought of a title for it yet! Talking of Transformations, WOW! We had a fantastic night on Tuesday at the ending of the auction. We managed to sell nearly all the pictures and now just have two left! It was a great evening. Ann Wilson the poet compared brilliantly and had the audience laughing. Raffles, poetry, more raffles and more poetry. It was all great. Big thank you to our poem readers Clare, Maggie, Dana and John. At the moment we reckon to have raised around £1700 from the project. We had an incident this week which very much reinforced to me what it is that makes S2C a place where people come. The sessions are such a refuge and boost to people really struggling with life. it feels safe and welcoming as well as maintaining a positive and supportive atmosphere. Given the people we work with it is inevitable that from time to time individuals can’t cope and all sorts of stuff comes out. Sometimes when that happens it can really badly effect the group as a whole and individuals within. The ability to recover that positive vibe and for the people there to rally round and support the individuals in crisis is a strength. There is nothing new to the group. Most have seen it, been there and had the awful experiences and know what it’s like. Empathy is a great healing tool and the positive support mutually given is invaluable. A mixed bag today. Some beautiful handmade gift tags, great collages and leaf drawing, some badge making, Christmas decorations and we put the log Christmas tree up ready to decorate. With the Kentmere group today we “aged”card by dabbing with used tea bags to create rustic looking tags ,which we then embellished with dried citrus ,bay leaves and other natural objects. These were printed on , or further decorated with washi tape. We also strung cranberries , beads , cinnamon sticks and dried apple slices to make vibrant sensory decorations. The room was fragrant and participants really enjoyed themselves. It was a brilliant night at the Town Hall Tuesday night for the end of Transformations. Ann Wilson was an amazing host keeping everyone entertained. Thank you to Ann, Clare, Dana, John and Maggie for their great reading of poems. At the end there was lots of bidding and along with donations and raffles we look to have made a fair bit of money for S2C. Off go do some counfing. Will let you know how much we raised soon. We are nearly at the end of our Transformations Project. Tuesday 24th November sees us in Kendal town Hall for the very last day when bidding ends at 9pm. Call in to see the artwork and maybe bid during the afternoon between 2-30 and 4-30pm. Then in the evening we have all but sold out of tickets for the grand finale. We have the poems being read by poet Ann Wilson and friends plus all sorts going on and of course the countdown to the end of the bidding. With £1200 already in bids this is proving to be a very successful project in terms of raising much needed funds for S2C. Of course the fundraising is only one aspect and not always the most important. This project has had significant impact on Space2Create in terms of widening awareness of what we do. We have reached many new people who will now be looking out for our projects and activities in the future. It has als had impact in terms of the quality of the work, both art and writing. I have had many comments made to me about the artwork but also how good and how powerful the writing that inspired it is. The combination of artwork and writing taken together add a whole new dimension. For the writers this has been an incredibly uplifting and positive experience. To have your words taken by an artist to produce a piece of art is a unique and very moving experience. Many of those who wrote for the project are constantly drawn to the artwork. In some cases it is a very real and tangible recreation of their thoughts. The Artists too have expressed how this has affected them, being moved by the words and coming to appreciate just what this project means to those involved. The DeafArt group was back this week after a couple of weeks break and they remembered to send us pics! They too were getting all abstract, selecting shapes to repeat and vary in size in random arrangements. Then they used rweally colourful designs to create some great finished images. The group continued the abstract theme. We looked at creating images by first placing lines then using blocks of colour. We also wanted to add texture so we used the paint thickly. In an extra twist we painted using plastic forks, knives and spoons. As well as this people worked on their own project, making g a bobble, lino printing and adapting donation tins. The participants worked on printed cards using a polystyrene tile. The image is drawn onto a roller with a biro, and then is indented into the tile so it can be seen when printed. This is an achievable, unique and very accessible technique, allowing participants to produce multiple images which are very effective. Collage and silhouettes were the major themes for the session today. The group was shown how to build up an image using strips of paper cut from sheets or magazines, and to place this image against a differing background to create a silhouette collage. Others eventually chose to be more free-form in their technique when building up their collage, and still others chose to draw their silhouettes in ink. Hey, pick me! Pick me! Hello…….. Being a small charity is sometimes tricky. Over the last three years we have worked away quietly in Kendal slowly gathering numbers as well as those who know about and support us. I like to think we also have quite a good reputation for what we do and a level of respect earned through the dedication and hard work of the volunteers. Sometimes it feels very much like we don’t really exist. In the pantheon of charities both locally and nationally we probably barely register on the giving radar. And why would we? I sat recently and tried to work out how many people we actually support, help or facilitate sessions for and after much pen chewing I arrived at a figure (for a week with a full programme) of 78 people. Lets do the maths. 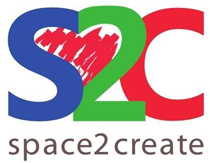 Space2Create generates income through sales, room hire and session fees. This leaves costs of around £12,000 a year which we need to get through donations or grants. so £12,000 divided by 52 weeks is £231 a week roughly. Lets divide that among the 78 people we have helped which means it costs £2.95 per person a week to run Space2Create. Before anyone complains I know this is a very very rough calculation! If you look at a lot of services that suddenly looks like damn good value. £12,000 may not sound like a lot but because we don’t have a large impact or a big presence it is actually damn hard to find. We are literally constantly three months away from closing. This is why something like our Transformations project is vital to our survival. Already it has raised over £1000. a big chunk of our yearly costs. We would love it to raise more but the problem is, with a small pool of followers and supporters there is not the scope to raise much more. We can look to a national event like Children In Need with a mix of envy and generosity. Indeed many of us at S2C will be donating to that very worthy cause or fund raising for it. If only a tiny bit could come our way though………. Please help us do what we do. Make a donation, buy a ticket to the evening event, make a bid on a piece of art and make Transformations something which keeps us open another year! We had an abstract session. First finding objects to draw round randomly. Then we joined these up free hand to create interesting shapes before using a variety of methods to colour and fill the shapes on to give a look of there being layers if possible. On the Ward, we were largely occupied in making Get Well Soon cards for two good friends of Space2Create. We created these using the style of Scottie Wilson, a Scottish Outsider Artist, whose designs we attempted to recreate using our own imaginative twists. We started by drawing simple figurative designs in felt tip, then subdividing them into segments using simple lines. We then used a watercolour backwash (of grey in differing shades, in this case), and, when this wa…s dried, filled each segment with various patterns in colour, often highlighted using fine black pen. We then repeated the process with looser shapes for the envelopes, and stamped names using letter blocks in the central shape on each. The effect in this case was hopefully suitably jolly and uplifting. Others practiced mark making using pre-prepared stamps, in what proved to be a very inspired and yet also relaxing session. The Unity group carried on with the abstract theme using the same technique as the 2Create group this morning. Drawing random overlapping shapes, linking them together then painting. Another enjoyable session. With Julie and Clare away Mat and Kevin tried to take charge but Val arrived with a great idea so everyone did that! We made snowflakes by folding six squares into triangles. Then cutting four strips into the joined edge. Then we rolled the opened sections in alternate directions, joined all six pieces to create a snowflake. Chris worked on decorations and Nigel was doing some still life. The group continued with the abstract theme. Many were finishing off pictures started earlier in the week. As well as this there was some knitting and lino cutting too. Oh and a fox mask!